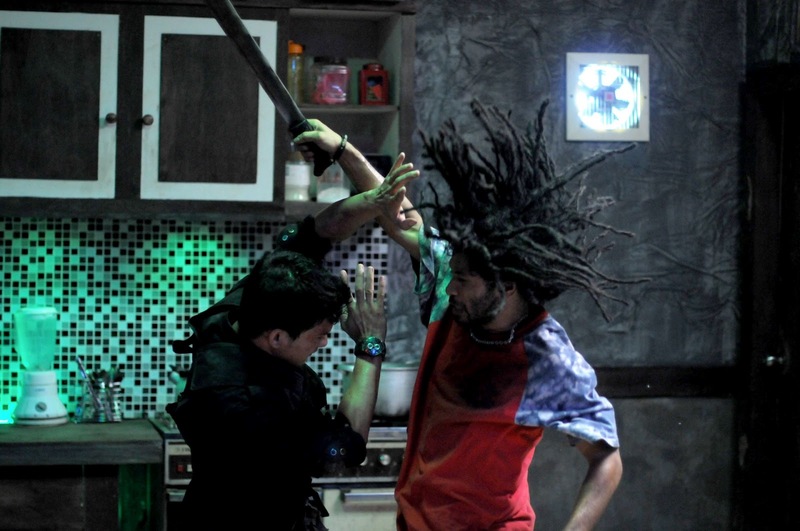 As a visceral action experience, Gareth Evans’ Indonesian martial-arts film “The Raid” is hard to beat. I can safely say I’ve seen very few other films that demonstrate such an awe-inspiring command of tension, action staging, and fight choreography. The film literally moved me to the edge of my seat multiple times, my mouth gaping open in amazement and terror at the on-screen chaos. It’s rare for a film to elicit such strong physical responses from the viewer, but there is a raw, spectacularly violent power to “The Raid” that cannot be denied. As an actual film, however, I’m considerably more ambivalent. Roger Ebert got in some hot water with fans earlier this month when he gave “The Raid” – which has been widely acclaimed since appearing on the festival circuit last year – a one-star review. The thing is, I don’t know how strongly, if at all, I disagree with most of Ebert’s assertions. When he insists that “No one in the film has a personality,” he’s absolutely correct. This isn’t a film with ‘characters.’ There are on-screen figures that engage in some impressive hand-to-hand combat, but they aren’t characters, and there’s certainly not a hint of development to be found from start to finish. Ebert’s argument that the plot is both paper-thin and often incoherent is also equally valid. There are very few conversations in the film, and I found most of them confusing in their attempts to hastily deliver inscrutable exposition. All that being said, “The Raid” is still an intensely entertaining action flick, the kind I can see developing a legendary cult life on home video and the midnight movie circuit. The premise, as noted above, is simple: in Jakarta, crime lord Tama Riyandi has turned a derelict apartment building into a dangerous, ultra-secure safe house. It’s filled with the most dangerous sort of people imaginable, and Tama sees everything from a set of monitors on the top floor. After years of police looking the other way, the order has finally been given to take Tama down, and an elite 20-man SWAT team is sent to raid the building. Things quickly go south as the team realizes they are completely unprepared for the mission, stuck on the sixth of fifteen floors with ruthless killers above and below them. Fighting ensues. Lots of it. 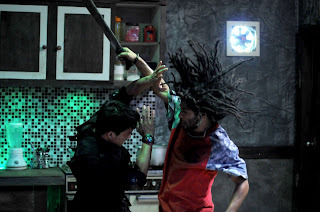 Writer/Director Gareth Evans is fascinated by the Indonesian martial-art style Pencak Silat, so while the team enters with guns, those who survive do so with the artistry of their fists. The fight choreography is absolutely out of this world; I don’t know if Pencak Silat has been widely used in action cinema before now, but I for one have never seen anything like it. Fast, precise, and ruthlessly efficient, every piece of combat is a true work of art; I can scarcely imagine how much time and care it must have taken to choreograph these battles, let alone execute them. The film’s star, Iko Uwais, also served as one of the main choreographers, and while a lack of character development stops him from giving what I’d call a ‘great’ performance, the level of authenticity he brings to the proceedings is nothing short of awe-inspiring. But it’s Evans’ masterful direction that makes “The Raid” such a gripping experience. He understands how to stage an action sequence as well, or better, than any other filmmaker I’ve yet encountered. Each set-piece is built around two crucial elements: space and stakes. Before anyone actually begins punching, shooting, or stabbing, Evans takes the time to show us the environment, to make sure we know where everyone is, what side they’re fighting for, and most importantly, who has the upper hand. Once the action kicks in, we are comprehensively aware of how the space is laid out and what danger the protagonists face. It’s an exceedingly simple process, yet it dramatically heightens the tension at every turn and makes the action infinitely more engaging; only after seeing an expertly crafted film like “The Raid” does one realize how many filmmakers just don’t understand how to effectively shoot action. When we all go a Michael Bay movie and come out complaining that we could never see or understand what was going on, that’s because Bay neglects what directors like Evans understand: that clarity, thoughtful planning, and effective visual communication are paramount to the success of a good set-piece. And “The Raid” is nothing but good set-pieces, top to bottom and start to finish. There are at least forty minutes in the middle where I can’t recall exhaling from being so tightly enthralled in the action, and even in lesser moments, I marveled at the imaginative audacity of the choreography. As I said in the beginning, on a visceral level, “The Raid” absolutely delivers on its hype. But it could, and probably should, have been better. There’s honestly no narrative film where I’ll give a pass to the lack of strong characters or coherent plotting, and while the strength of the action made up for that for me, if you – like Roger Ebert – find yourself uninterested or turned off by the focus on “wall-to-wall violence,” there’s nothing for you here.